If you’re going to develop an application around the idea of ongoing micro-transactions, and many people have chosen to do exactly that, then the most important consideration is likely going to be smooth integration of payment options. Amazon used the essence of this in the creation of the Kindle Fire itself. The whole tablet is basically a way for customers to get the content they want without thinking too hard about where or how to get it, all while keeping the actual act of purchase as unobtrusive as possible. Until now, however, app developers wanting to cater to Kindle Fire users have been unable to turn this to their own advantage. We know they have been looking into making this happen for quite some time, but apparently now we have some confirmation of active testing being done in preparation for a more large-scale roll-out. One of the founders of Skimble Inc, the maker of some physical fitness programs that have been involved with the pilot, revealed some of the details. There will be both individual purchase options and the ability to set up a subscription. This will be handy for newspapers following Amazon’s recent recommendation that potential newspaper submissions set up their own apps rather than getting into the Kindle Store’s selection. Amazon’s cut on every sale will be the same 30% they take on eBooks and app sales in general. This opens up whole new avenues of income both for Amazon and for app developers participating in their Android app store. Currently anybody looking for regular income from their users is forced to either sell ad space in free apps or arrange some sort of non-integrated system for content purchases. It is a smart move that puts the company in a much better position to capitalize on the Kindle Fire and Android app sales in general. This is not a trivial thing to get going. Amazon absolutely needs to get things right. There have already been complaints about their parental controls thanks to poorly functioning and completely missing options in the initial release of the Kindle Fire. Users need the assurance that this will not be an issue in the future. Many will remember the iPad in-app spending horror stories resulting from unrestricted purchasing options. Children were able to charge thousands of dollars buying virtual goods with no notice or warning screen until Apple came up with more refined controls. Such have not been nearly as necessary for the Kindle Fire before now, but adding this feature to the system will require some changes. While Amazon has the best selling Android tablet on the market today, they have the smallest of the three major tablet app stores. Part of that is the heavy oversight they keep in place to ensure quality control among their offerings, but a lot is also lack of developer interest. While developers are likely to make significantly more on their app sales through Amazon than through Google Play, the initial sale is not the only source of income for many companies. If Amazon gets this working, and working well, it could lead to a huge boom in Kindle Fire app-building. I was browsing through some random reviews, recommendations, and complaints about the Kindle Fire a bit earlier, trying to get a feel for the reactions as people get used to them, when I came across the truly unbelievable claim that the Kindle Fire‘s major flaw as a family device was its lack of parental controls. Now, there are a few reasons to get something besides the Kindle Fire for use with kids, such as some games not yet being available through the Amazon App Store or wanting to avoid the guilt of competing with your own children over the use of a favorite toy, but Parental Controls just don’t make the list. In an effort to help people better understand their device, let’s go over how this works. By enabling Parental Controls on your Kindle Fire, you can prevent unauthorized purchasing. This works in two ways. Simply switching the setting to “On” will require entry of your Amazon account password before any purchase of anything in an App. There is a second setting in the same menu tree that blocks in-app purchases entirely. You also get the option to set a four digit PIN that can be used in lieu of your password, which can be convenient and is always going to be faster than entering a really secure password. The most important things that the basic settings will fail to do are prevent purchasing and prevent app access. The former is simple enough. You can disable Mobile 1-Click Purchasing from the “Your Apps & Devices” settings on Amazon.com. 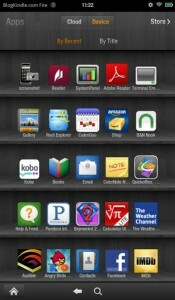 Simple enough, you just can’t do it easily from directly inside the Kindle Fire‘s menu system. As far as the app access goes, to the best of my knowledge there is no work-around. If you have an app that doesn’t require a password, anybody can use it. Why Bother With Parental Controls? There was a great deal of controversy over some of the iPad’s apps earlier this year when their micro-transaction model, coupled with an emphasis on entertaining small children, resulted in ridiculously large charges being run up without parental consent. There are always going to be games on the Appstore, of course, and it would be silly for us to expect them to avoid something as profitable and tempting as micro-transactions, so it’s probably best to be prepared. Amazon admittedly seems to be doing great at keeping on top of all of their potential customer service disasters so far, but something is going to slip through eventually. Don’t be the one to find out too late that you owe $10,000 over digital Smurf accessories after leaving a child alone with your Kindle Fire.